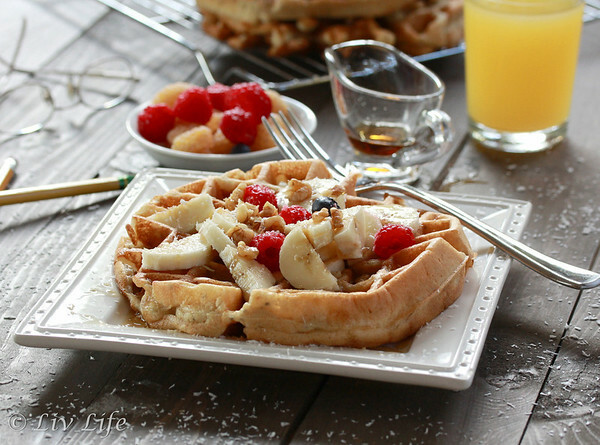 Topped with fruits and a sprinkle of nuts and/or shredded coconut, these nutritious and lower in fat Belgian Waffles bring a a taste of the tropics to your breakfast table. And mixing the batter the night before makes the morning work a snap. In a large mixing bowl combine the flours, flax, chia and yeast. Whisk to combine and set aside. In a medium bowl, add the coconut oil, sugar, milk, eggs and vanilla extract. Whisk vigorously to combine. Pour the wet ingredients into the dry ingredients and whisk vigorously again to combine thoroughly. I usually give the batter a good 1-2 minute whisk (good for your arms! ), or use a hand mixer to combine. Note: the batter should be thin... add a touch more milk if necessary. When ready to use, remove the batter from the fridge. Heat up your Belgian Waffle Maker and follow the directions that came with your maker. 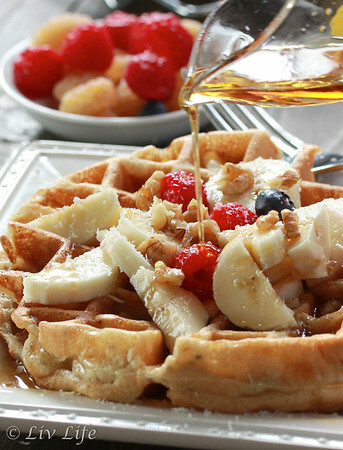 Top the waffles with various fruits and nuts and serve with maple syrup or agave. Enjoy! 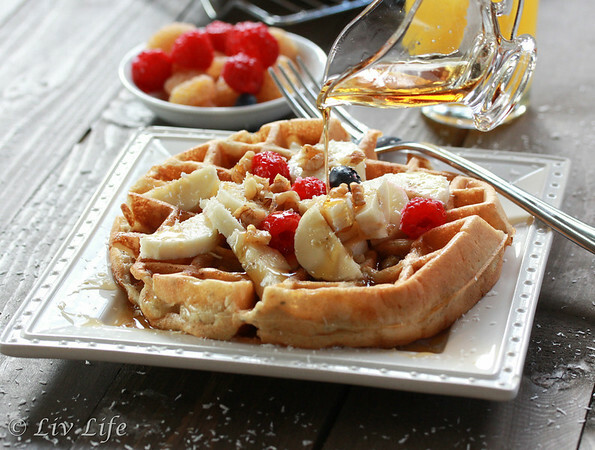 Liv Life Note: We've been through a few Belgian Waffle Makers, but this Waring Pro WMK600 Double Belgian-Waffle Maker from Amazon is currently the one on my counter!